Do you think you have what it takes to be a top model? Then join Maybelline's search for 8 new BB Top Models. 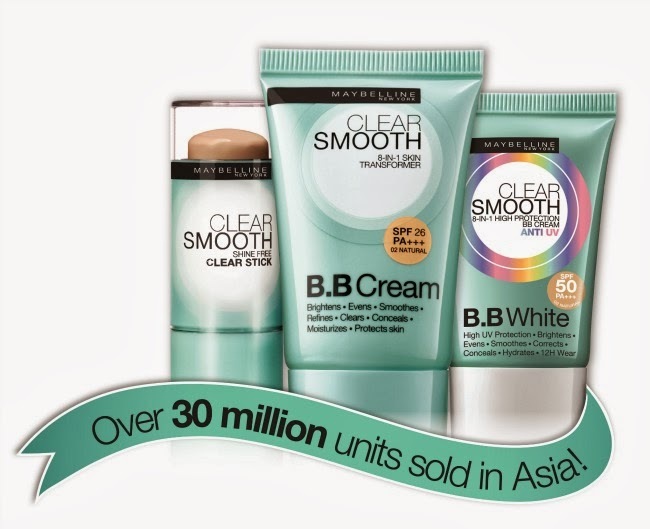 MAYBELLINE Clear Smooth BB has sold over 30 million units in Asia and is one of the widely popular BB brands. Known for its 8 healthy benefits, the 8-in-1 BB Cream brightens, evens, smoothes, refines, clears, conceals, moisturizes and protects to give you perfectly flawless skin in an instant. BB Stick (for oily skin) P289 - The first BB Stick with 12 hour anti-shine powder finish! With its silky smooth application, it gives you a shine free powder finish every time! BB Cream (for normal to dry) P259 - Covers like foundation but doesn't cake, protects like sunblock but isn't sticky, and moisturizes like skincare without being oily! BB White (sun protection plus SPF50) P299 - Conceals and protects-the ultimate sun protection for brighter skin in just one step! ALL MAYBELLINE BB PRODUCTS ARE AT P50 OFF ALL MONTH OF NOVEMBER! With its affordable price, 8 healthy benefits, flexible shades and varying formats, top models from New York all the way to Asia choose Maybelline Clear Smooth BB! I love how it feels on my skin - very light and smooth. That's why I wear it all the time! Because MAYBELLINE Clear Smooth 8-in-1 BB gives you perfect skin with its 8 healthy benefits, we’re looking for all aspiring models who believe they have what it takes to be one of 8 MAYBELLINE NEW YORK BB Top Models who will represent Clear Smooth 8-in-1 BB in a photoshoot and win a P100,000 modeling contract with Ideal People Models. • 8 winners will be named MAYBELLINE 2014 BB Top Models and be ambassadors for Clear Smooth 8-in-1 BB for a year. • The highest scoring model will receive an exclusive 1-year modeling contract worth P100,000 with Ideal People Models, one of the country’s most reputable modeling agencies, while the runner up will receive a P50,000 contract. And now the best part....well not really....since my modelling experience is close to nada and like Zoolander, I only have one look to teach you...but seriously...I guess the people at Maybelline saw something in me because they chose me among other bloggers to mentor those of you who are interested in joining the competition. I'm with you on this one. Anderson is in Tacloban, SHE IS NOT.